Download our April 2015 Advocate now: To read and print out our newsletter, click the image. Please be patient, the file size is fairly large. 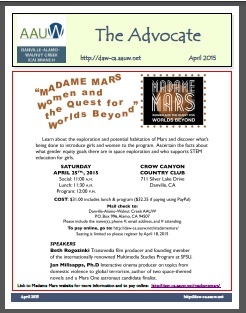 – Sign up for our April 25 Madame Mars Program and General Meeting now. – Time to volunteer and buy tickets for our 2015 May Garden Tour. Submission deadline for the May 2015 issue of The Advocate is April 15. Please provide all website, newsletter or calendar submission through our submittal webpage.